Darwin thought that evolution only happens slowly. Indeed, from the emergence of life on earth, it was several billion years before modern humans arrived on the scene. However, in bacteria, viruses, and other micro-organisms, evolutionary change can occur on a timescale of months, weeks, or even days. My work at the Sanger Institute, in the group of Ville Mustonen, investigates cases of rapid evolution. Cheap and rapid genome sequencing allows us to do this in novel ways. Genetic changes in a microbial population can now be seen as they occur. By collecting genome sequences across multiple points in time, we can pinpoint the arrival of new mutations in a population, and follow the effects of natural selection. Modern sequencing shows us the “what” of evolution. My research asks the question of “why?”. Natural selection acts upon a host of biological properties, shaping a population in one way or another. In microbes, properties under selection include the ability to survive antibiotic treatment or to evade the human immune system. My research aims to find where in the genome selection has been at work, and to identify genetic causes for biological change. In some cases, genetic effects that are under selection can be found easily. A mutation that conveys a strong benefit to an organism is likely to spread through a population: individuals with the mutation survive and reproduce, while those without it die out. The frequency with which the mutation appears increases over time, leaving an easily identifiable signature in the sequence data. Pinning down selection becomes more difficult when multiple mutations appear in a population at the same time. In an effect known as clonal interference, beneficial mutations in different parts of the population compete for success. Simultaneously, less beneficial mutations can be carried by strongly beneficial mutations. Those close in the genome to a helpful mutation ‘hitchhike’ their way to success. 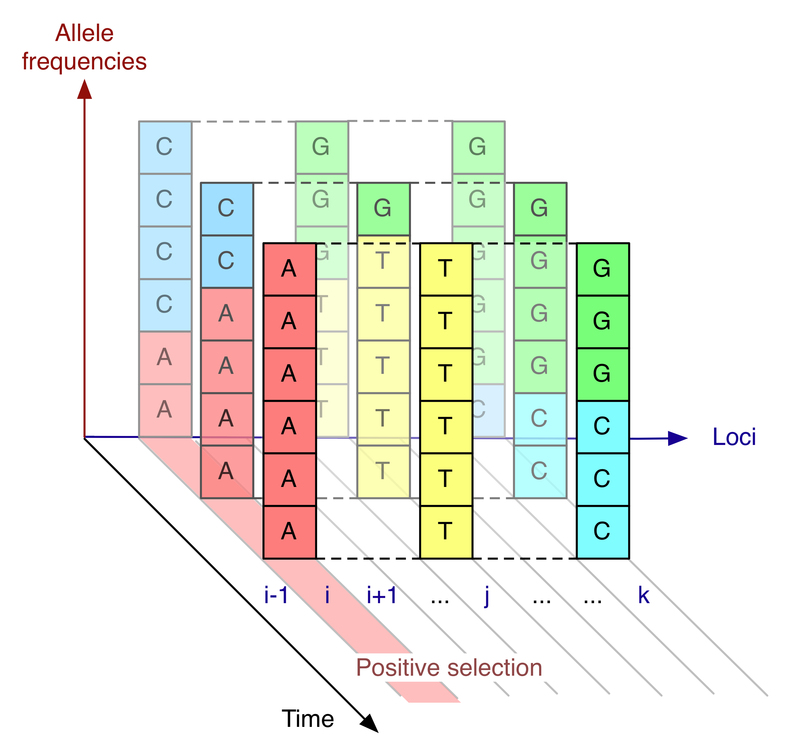 The frequency of a mutation changes, not only due to its own selection, but also because of selection acting upon all of the others. My most recent work at the Sanger Institute has focused upon untangling the effects of selection in scenarios such as this. In the seasonal influenza virus H3N2, mutations occur very frequently. People who are infected by the virus become immune, but only to a specific strain. Through a process of evolution, the virus can change enough to infect a person again, allowing the virus to spread around the world from year to year. Using a new computational approach, and multiple genetic sequences, collected across time, we studied this process of H3N2’s evolution. Calculating the strength of selection caused by each individual mutation, we found that interference effects are highly important for influenza evolution. Whether or not a mutation spreads throughout the flu population is more due to interference than to the inherent benefit of the mutation itself. Our work offers a new approach to studying rapidly evolving populations, such as influenza, which are harmful to human health. By understanding the processes by which viruses evolve, we hope eventually to lessen their destructive impact.